Year Two; Full speed Ahead..sort of! Post Number One of Year Number Two! 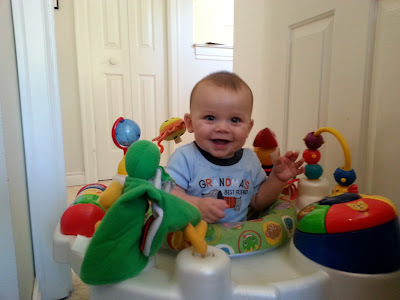 As I’m sitting here writing my first blog post in a while (after a busy summer concert tour I've set a schedule and am back on track), my six-month-old grandson sits next to me playing happily in his saucer. He coos and squeals with delight as he bounces and turns around, visiting each of the brightly-colored toys at his fingertips. To all appearances, he is totally happy and entertained. That is, until I say his name and join his cooing conversation. Instantly he turns to me. His face lights up in a big smile and now he is REALLY engaged and happy! “You noticed me,” he says with every squirming learning piece of his body. He bounces extra hard and makes as much noise with his circle of toys as is possible. He is irresistible, and I see there is no work to be done here but document this magical moment in time. In this moment I am the richest and luckiest human on the planet, and my grandson clearly feels the same. This is what we are designed to do - even to keep our species going. I am lucky to share in the caring of my three young grandchildren, and as I move Sing With Our Kids into year two, we are doing it together. They are my North Star, helping me keep my priorities straight and always remember why I am on this mission. So I’ll sign off this first blog post of year number two of Sing With Our Kids. Right now I have some even more important work to do!